ASUU STRIKE: What should I do? NEVER BE DOWNBEAT – Have Hobbies: To be honest, I try really hard to keep myself from losing it in medical school. From the late hours in the wards or emergency unit to the gruesome ward rounds with the persistent “percussions” back to the voluminous amount of knowledge to be gained from textbooks, materials and research items. I have to admit that I realize that all these are for the greater good, for we medical students to be the best at what we do. Notwithstanding, the stress can eventually get to us all as I have seen it get to a handful of people. Personally, the decision to get into this profession was one I made entirely of my own accord, and so I have made it an aim to come out of it making my way through whatever struggle I stumble upon. There is a popular saying in Nigeria: “I cannot come and go and kill myself”. Following this, I made a decision to put my most effort into school but also that whenever I feel the tension building up to an intolerable point, I have to find a way to release said tension. And this is something I feel all medical students should at least try to do too: HAVE HOBBIES. On this note, I would like to give a shout out to the M.B; B.S 2K16 set of the University of Ibadan for showing great diversity. Don’t relent. Having hobbies provides a means to reduce the stress. Hobbies definitely help you relax. They provide a period, no matter how short, for you to delve into something that distracts you from the day-to-day rigors of medical school. There are a lot of hobbies from which you can pick and rotate through. From the basics such as traipsing, digging into a novel, seeing a movie with friends, listening to songs, eating out in fancy places, learning how to play a musical instrument, gaming with friends to taking a trip to somewhere new and getting a feel of new environments. These help to calm the mind. Some can also say partaking in activities in your immediate environment help to take your mind off the worries of school, and help you think in a much broader manner. Take up leadership roles, join committees, work in tandem with others and experience a larger set of thought processes outside your own. Keeping the mind busy with things of importance can go a long way in not thinking one’s way to doom. Sure, we are not all made in the same way to be loud or to be ultra-quiet; but there is something out there that has the potential of keeping the minds of each and every one of us in check. Find it and stay upbeat. Written by AKANDE Michael a 500 level Medical Student at the university of Ibadan. 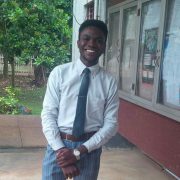 Akande Michael is a 500 level medical student at the University of Ibadan. He is from Kwara State but resides in Ogun State and is the third child out of four because of which growing up was a big struggle. He had his primary education across a few schools, but spent the most time in Kingsville Nursery and Primary school, Egbeda, Lagos where he eventually graduated from. He went on to have his secondary education at Christ the King Catholic College, Odolewu-Ijebu, Ogun state after which he gained admission into the University of Ibadan to study Medicine and Surgery. His hobbies are reading novels(mainly fantasy, science fiction, and crime thrillers), singing, writing and playing football. And he tried all these while still going through the rigours of medical school. He likes helping people and hopes to achieve a lot of that through his course of choice. Vacation! A fantasy in medical school Part II. Beautiful piece. I am so enlightened. Isaias Roecker on Caused by the gods? CHIDERA HENRY EZEH on ASUU STRIKE: What should I do?